American football prodigy Jared Goff is currently among the fast-rising stars in the National Football League. He has been a prominent member of the Los Angeles Rams squad and has completed three professional seasons with the team. The talented player turned pro in 2016 after being selected by the Rams in the NFL draft of 2016. Notably, he was the first overall player to be selected that year and has been named to the Pro Bowl twice. Despite starting his rookie career with a low output, Jared continued to make strides for his team. His efforts paid off in 2017 when he was honoured as the PFWA’s Most Improved Player of the Year. Learn more about the quarterback below. Jared Thomas Goff was born on the 14th day of October 1994 in Novato, California. He was born to American parents Jerry Goff and Nancy. He was raised along with his older sister Lauren. His father is a former baseball catcher who played professionally in the Major League Baseball. Developing an interest in football at an early stage, Jared was inspired by the former NFL quarterback named Joe Montana. Jared graduated from Marin Catholic High School where he kicked off his football career. While he was there, he had a career record of 18 interceptions, 93 touchdowns, and 7,687 passing yards. He led the school team to appear in three MCAL Championships as well as the state finals and NCS playoffs. At the end of his high school career, Jared enrolled in the University of California. Joining the Golden Bears, Jared was made the starting quarterback for the team in his freshman year. During his three-year stint with the Bears, Jared was able to set a single-season record in his freshman year with 3,508 passing yards. The following year, he made 35 touchdowns and 3,973 yards. In his junior year, Jared helped the team to triumph over Air Force Academy to win the Armed Forces Bowl championship held in 2015. He also set another single-season record for passing yards with 4,714 yards; thus, becoming the second player in the school history after Aaron Rogers to achieve this feat. At the end of his junior year, Jared Goff decided to join the 2016 NFL Draft while forgoing his last college season. Prior to the NFL draft of 2016, Jared Goff was projected to be among the top picks. After putting up an impressive performance in the combine drills, he finally became the first overall player selected during the draft. He was chosen by the Los Angeles Rams and later on, he penned a $27.9 million four-year contract with the team. The contract included a signing bonus of $18.6 million. He started his rookie year as a backup to Case Keenum in the 2016 season. However, after nine games, he became a starter for the remaining seven games that season. He ended his rookie career with a record of 1,089 yards. He also made 7 interceptions and 5 touchdowns in the same season. With the emergence of Sean McVay as Rams’ head coach in 2017, Jared was highly favoured as he got more playing time that season. Playing the main quarterback for the team, Jared made 15 appearances, completing 3,804 yards. He also had seven interceptions as well as 28 touchdowns. 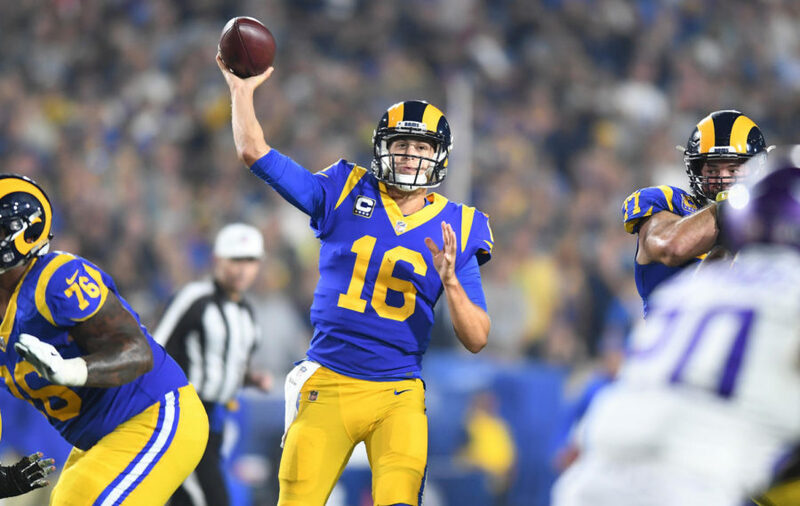 Goff’s spectacular performance in 2017 earned him a Pro Bowl call-up and he also received the Most Improved Player from the Pro Football Writers Association. He stepped up his game in the 2018 season; hence, having a career-best with 80.5 percent pass completion. He got his second Pro Bowl selection at the end of the season with a career-high of 32 touchdowns, 12 interceptions, and 4,688 passing yards. As far as Jared Goff is concerned, the outstanding quarterback is not injury prone and hasn’t suffered any significant injury since the inception of his professional career. Does Jared Goff have a Wife or Girlfriend? Goff’s personal life details show that the quarterback appears to be living as a bachelor and doesn’t have a wife or girlfriend. Jared made this known during an interview with Jimmy Kimmel on his draft night in 2016; the quarterback revealed he doesn’t have a girlfriend or wife. Meanwhile, he has never been linked to anyone or relationship to date. Jared also said in an interview with ESPN in 2018 that the reason he doesn’t have a wife or girlfriend is that he hasn’t met the right person yet. Apparently, the NFL star is currently single and is focused on reaching the top of his burgeoning football career. Height: How Tall is Jared Goff? The Rams’ quarterback has a wonderful and attractive appearance. He is very tall, standing at 6 feet (1.93 m). He has a masculine bodybuild and an ideal weight of 101 kg (222 lbs). Jared has a hand size of 9 inches as well as arm length of 32 ¾ inches. In addition, the quarterback has blond hair and blue eyes.